A giant, spinning disc of ice in Maine has drawn the interest of tourists, scientists and ducks alike. A giant, spinning disc of ice in Maine has drawn the interest of tourists, scientists, and ducks alike. Measuring approximately 100 metres in diameter and spinning at a rough rate of one rotation per 30 minutes, the circular ice floe has mesmerized crowds of onlookers on the banks of the Presumpscot River in Westbrook, Maine. "It's a beautiful, spectacular thing," Mark Battle, an associate physics professor at the nearby Bowdoin College, told As It Happens host Carol Off. "It's just a beautiful aesthetic phenomenon." While the formation's perfectly circular shape has drawn comparisons to crop circles and prompted speculation about alien activity, Battle says it's a completely natural phenomenon that has been recorded several times throughout history. In fact, a Scientific American article quotes a reader who described "a revolving ice cake" on Mianus River near Bedford, N.Y., in 1895. "It's not unprecedented, but it does seem to be unusually large," Battle said. These formations occur, Battle explained, when tiny ice droplets suspended in the water "gradually coalesce in a region where the current holds them roughly in place, "forming a sort of a mat." 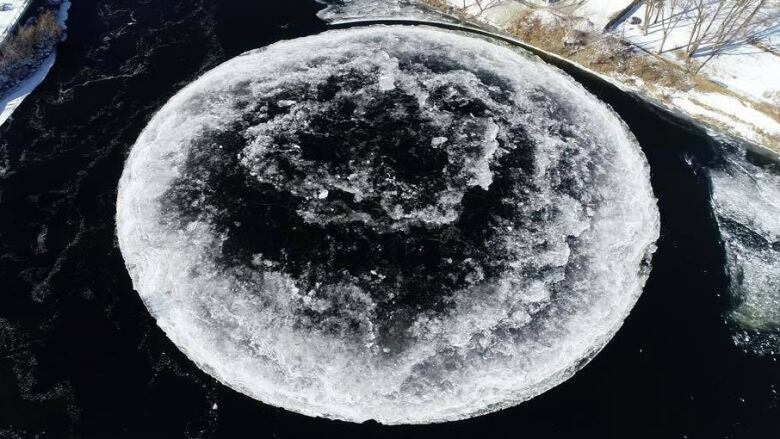 This particular ice mat formed in a part of the river where there's a circular current that creates a whirlpool effect, he said. "The circularity of it seems to be a result partly of the currents directing these little bits of ice to bind together in a particular region, but also abrasion with ice that's formed on the shores," he said. "So as the piece spins, the edges of the piece on the margins that stick out more or less are worn away and you end up with something beautifully circular." Officials say the disc is spinning slowly counter-clockwise, and has served as a big raft for ducks and other birds hopping on and hitching a ride to the other side of the river. "There were ducks sitting on it. The ducks were rotating on this big Lazy Susan," Rob Mitchell, who owns a nearby office building, told the Portland Press Herald. "It was a big duck-go-round." Battle, who was out Tuesday snapping photos of the disc and trying to take some measurements, says it was quite the scene to behold. "There was a modest crowd and a steady flux of people coming and going, taking pictures and just enjoying the whole thing," he said. "It had a nice community feel to it." Written by Sheena Goodyear. Interview with Mark Battle produced by Ashley Mak.